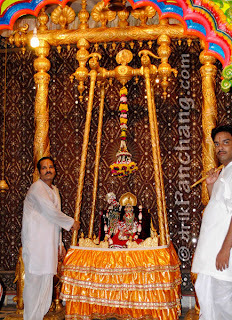 During Sawan month, various events are organized at Thakur Dwarkadheesh temple, Mathura. July 23 was the first day of Sawan month. 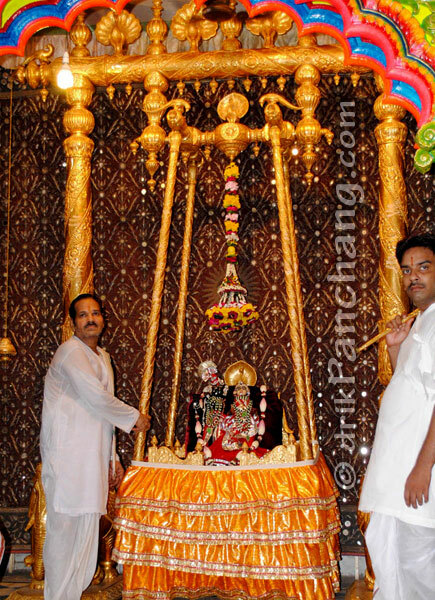 Traditionally on the first day of Sawan month, special Darshan of Lord Dwarkadheesh on the golden and silver swings is arranged. Devotees throng the temple premises to get one glimpse of Lord Dwarkadheesh on the golden swing which is popularly known as Hindola (हिंडोला). Radha Rani, the consort of Lord Dwarkadheesh, accompanies Him on the Hindola. On this day, the whole temple echoes in the acclamation of Lord Dwarkadheesh. The festivity which starts on the first day continues throughout the Sawan month. Another worth watching event during the month is “Sawan Ki Ghata”. When the whole temple premises and atmosphere is immersed and decorated in a single color motif, it is known as Ghata which is very popular during Sawan month. Once Sawan is over, it is time to prepare for Krishna Janmashtami.